Bolivian workers received an unexpected gift this past Christmas: an extra payment equal to one month’s wages, mandated by President Evo Morales on November 20. Along with the additional month’s salary that employers are legally required to pay each December, which is traditional in many Latin American countries, the new measure amounts to a double bonus (doble aguinaldo) of roughly 17%, and a triple payment for the month. 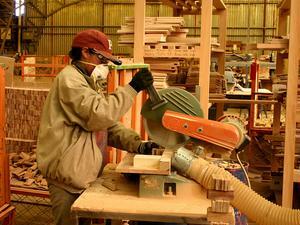 Salaried workers at United Furniture, El Alto. Credit: Ben Achtenberg.According to the new executive order, the double bonus must be paid to all salaried workers in the public and private sector, not only in 2013 but also in every year in which economic growth exceeds 4.5%. The government has characterized the double bonus as a redistributive measure, designed to socialize profits and allow the benefits of Bolivia’s current economic boom to be shared by the workers who are responsible for creating it. 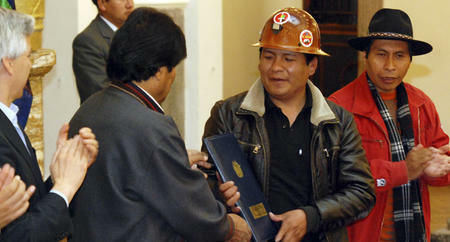 “The economy is good and the country’s growth should return to the workers,” Morales said in announcing the new program. Finance Minister Luis Arce noted that private businesses gained more than $4 billion in profits in 2012. The double bonus has been well-received by organized sectors that are traditionally supportive of Morales, and also by the COB (Bolivian Workers Central), a sometimes adversarial constituency. Others, including business and some popular sectors as well as independent analysts, have been quick to criticize the measure’s exclusionary aspects, potentially negative economic consequences, and apparent political motivation ahead of the 2014 presidential election. As the non-profit research organization CEDLA (Center for Labor and Agrarian Development Studies) has noted, the double bonus will benefit only 18% of Bolivia’s economically active population who are salaried workers. It ignores the other 82% who toil in the informal sector but have also contributed to the creation of economic value, as have former workers who are now retired pensioners, and unpaid workers such as housewives, who have made the labor of others possible. Organized pensioners quickly mobilized to demand inclusion in the double bonus, resulting in an agreement with the government to increase the benefits of some 120,000 retirees by 3% in 2014, on top of the regular inflationary adjustment (around 5.7%). The double bonus will also be extended to domestic workers who work at least 20 hours a week, or 4 hours per day. The pension agreement will cost the Bolivian government an extra $24 million, in addition to the $55 million that the government estimates is needed to cover the double bonus for 400,000 public employees in four major sectors (teachers, health workers, military and police). Retirees demand Christmas bonus. Credit: Miguel Carrasco, La Razón.As former Bolivian Central Bank president Juan Antonio Morales argues, investing the funds in health or education services might have been a more equitable way to redistribute economic wealth, instead of providing a transitory benefit to the 20% with formal jobs. Other economists caution that the sudden infusion of spending cash into the economy will drive up prices, nullifying the benefit of the double bonus for those who receive it, and creating even more hardship for the majority of the population that does not. Still others are concerned that the double bonus, which amounts to a tax on formal employment, could discourage salaried jobs and further incentivize informality. They note that the most profitable economic sectors (such as hydrocarbons, finance, and agribusiness) that can readily absorb the cost of the double bonus provide few jobs for Bolivians. In contrast, employment-intensive sectors (such as manufacturing) tend to be dominated by small and marginal enterprises—which, according to CEDLA, represent 94% of Bolivia’s 110,000 registered businesses. The Association of Micro and Small Businesses (MyPE) reports that its members will be forced to reduce their salaried workforce by 50%, on average, as a result of the double bonus. In response, Morales has agreed that private businesses can delay payment of the second bonus until February 28. The government will offer credit on flexible terms to small and micro businesses that can demonstrate ability to repay, as well as 6% bonds to the general public to promote savings rather than inflationary spending. As for businesses that might be driven under by the new program, Morales has offered unspecified assistance to facilitate their conversion to worker-controlled ownership. To date, the government has not accepted a request by foreign gas and oil companies, operating under joint venture agreements with the state hydrocarbons company YPFB, to transfer the cost of the double bonus for their workers to the state. Still, in a cost-saving nod to this sector, directors, department heads, and other executive-level staff have been excluded from the mandatory bonus. For critics of Morales, the double bonus is designed primarily to shore up political support from key voting sectors in the run-up to the 2014 presidential election, especially the wayward COB. This strategy has proved to be successful. COB leaders applaud double Christmas bonus. Credit: El Deber.In recent years, the COB has had an ambivalent and often adversarial relationship with Morales. Tensions reached new heights last spring when miners, teachers, and health workers mobilized in La Paz for increased pensions, supported by roadblocks and strikes across the country, resulting in more than 20 injured and several hundred detained. Last January, the COB formed a new Workers Party to participate independently in the presidential elections. Following the announcement of the double bonus, the COB leadership withdrew support for the Workers Party and proclaimed its renewed political allegiance to Morales. The COB’s endorsement is viewed as key to achieving Morales’s ambitious goal of 74% electoral support—10 points higher than the 64% he obtained in 2009, and 20 points higher than his 54% vote in 2005. The double bonus may also become a convenient source of campaign financing for the MAS, Morales’s political party. MAS officials have openly encouraged party loyalists to contribute 50% of the second payment to the electoral campaign, a source of funds that is especially critical now that direct state subsidies to political parties have been eliminated by the government. According to one estimate, likely contributions from public employees could generate as much as $7 million to jump-start the MAS campaign. At least for now, the political strategy appears to be paying off for Morales. 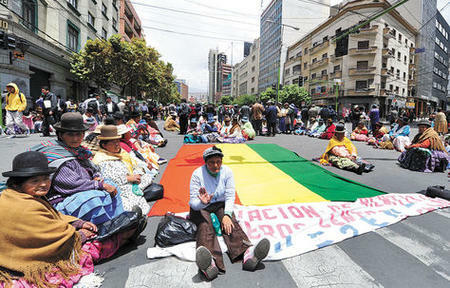 Polls show his approval ratings in Bolivia’s 4 largest cities up from 51% to 56% since the double bonus was announced. Still, more than 80% of those polled two weeks later believe that the price of basic goods will go up, and more than 70% think that businesses will be negatively affected, as a result of the double bonus.